Material obtained from alabaster type mineral in especial high impact mills that achieve a particle’s progressive decrease until a 325 mesh micro pulverization is obtained. 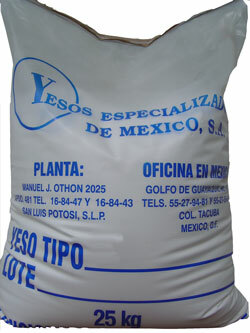 There are many selections before the grinding and the results are a great purity and perfect whiteness material. The two crystallization’s water molecules remain after the grinding. This material DOESN’T HARDEN WITH WATER, that is the reason why it has different uses than the other plasters. Used in pharmaceutical, agricultural, food and brewing industries, etc.